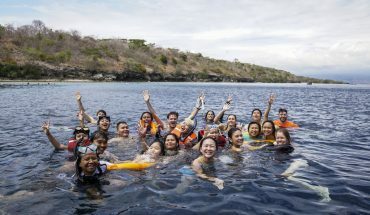 There is nothing more wonderful than being out at sea with the sea breeze in your hair, flippers on your feet and your snorkeling set ready to put on for some underwater exploring. Coral gardens, tons of exotic fish in all the colors of the rainbow and big sea turtles await. You can charter a private boat or go with a group on a glass-bottom boat. 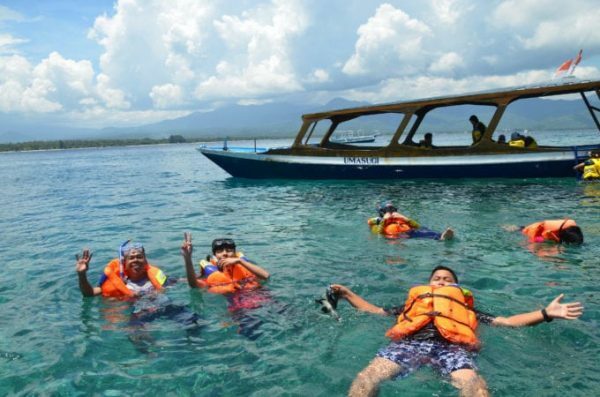 You will go snorkeling at several spots around the 3 Gili islands and have a lunch break in between on Gili Air or Gili Meno. One of the best things about the Gili Islands is that they are free from cars, motorbikes, traffic jams and smoke. The air is clean and the only noise you’ll hear is the sound of horse carts. The island makes a perfect playground for those who like to walk or cycle along the coastline and the rural village roads in between. So hop on your bicycle and cycle around to explore the entire island, only stopping for a cold young coconut or a quick swim in the sea. You can rent bicycles everywhere, starting from Rp. 35.000 a day. Put on some sunblock, wear a sun hat and sunglasses and bring your bathers and beach sarong. There is nothing more you need for a wonderful day! Diving is one of the main island activities. On Gili T, there are many dive schools where you can book yourself in for a scuba dive or a diving course to get your PADI. 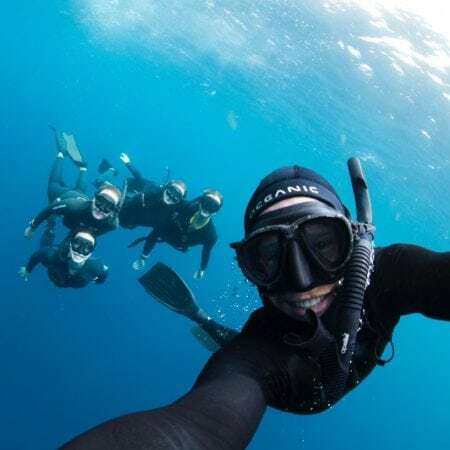 You can also go free diving for another amazing experience below the surface of the sea. Advanced divers will love diving at Deep Turbo where there are lots of little caves to be explored. Another great spot, also good for beginners, is Hans Reef where you can spot real interesting and rare sea creatures such as the frogfish. Also make sure to dive at Shark Point where you can swim with white-tip and Black-tip Sharks, Jacks, Barracuda, Angelfish, Snapper, and Blue Spotted Stingrays. 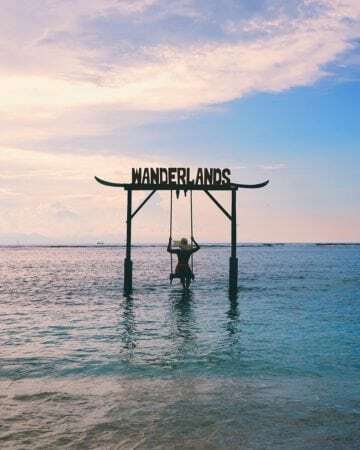 Starting from the northern coast of Gili T, you can go on a guided paddleboarding tour to see turtles or even paddle over to Gili Meno if the tide allows it. You can also rent paddleboards by the hour and go explore the waters around Gili T yourselves. Great fun! When the sun is about to set, head over to the quiet west side of the island for some sunset gazing. The best spot? The ocean swings! There are plenty of them, so sit on one of the ocean swings and let your feet dangle in the water as you swing back and forth to the view of the orange-glazed sky. It is a wonderful experience and you can snap some gorgeous photos, too! Afterwards, sit down at one of the beach bars and order some cocktails before the stars pop out in the island night sky. 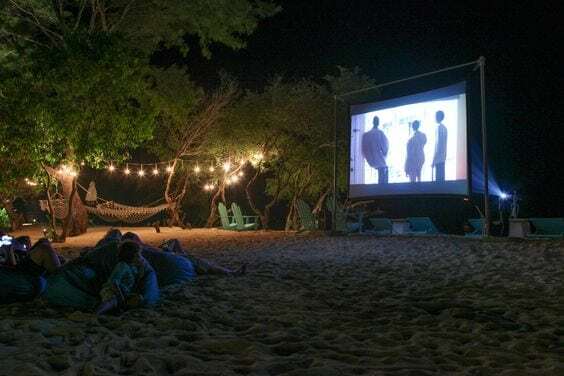 Upon nightfall, before the party kicks in, there are plenty of beachfront venues set up as outdoor cinemas. Most of them are free of charge as long as you order drinks. It’s a great way to spend a few lazy hours in the evening. Most of the movies start at 7 or 8 pm. You can also go for a private beachfront cinema experience in one of the beach huts at Beautiful Life, a hotel on the south-eastern coast of Gili T.
You can be almost sure of spotting sea turtles during the snorkeling trip on the glass-bottom boat but you can also swim with these amazing sea creatures right from shore on Gili Trawangan. Just head over to ‘turtle point’, swim a couple of meters over shallow waters until it gets deeper and from there, let the current take you. 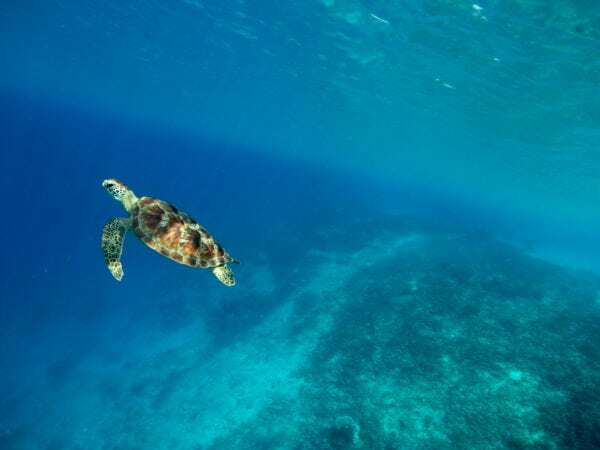 With a bit of luck, you will encounter one or two sea turtles. You can swim with the turtles and watch them sleep or eat but don’t touch the turtles if you love them. Gili T is where the party is on. 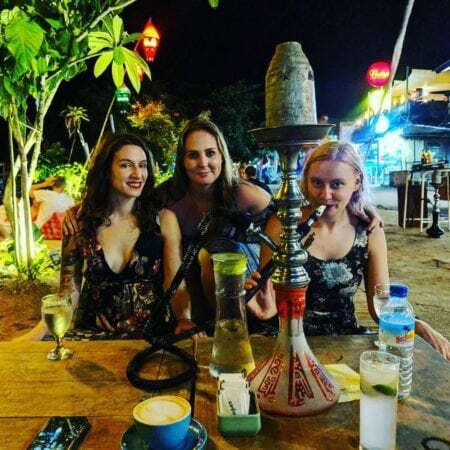 Music, drinks, lights, bars, shisha water pipes – everything for a good time with friends and like-minded travelers. You can dance the night away under the stars. Check out Sama Sama for some great live bands playing those good old Bob Marley songs or head further south to the main party spot, just behind the night market. Can’t get enough of the partying? Why not join the party on a so-called ‘booze cruise’. The party boats circle the three Gili Islands and they make a stop at Lombok, too. There are Djs playing party tunes, there are free shots of booze, drinking games and craziness. A great way to party off into the sunset! All around the islands, there are plenty of oceanfront restaurant serving great, fish and seafood. 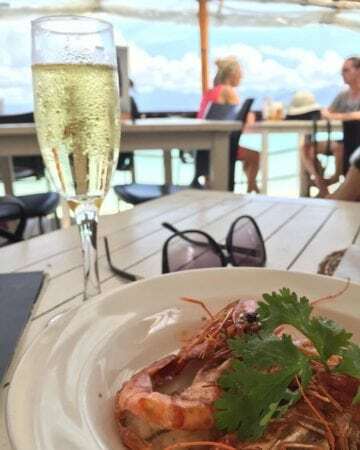 Danima Restaurant, Scallywags, Ko-Ko-Mo and Pearl Beach Lounge – all are great places to sit down and munch on a feast of freshly caught red snapper, prawns, clams, crab and more ocean treasures. My advice is to just stroll around in the late afternoon or early evening and sit down at any of these awesome beachfront venues. Live music, great food, nice cocktails, everything for a great evening out! 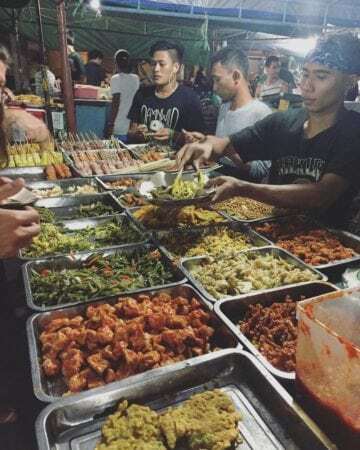 Traditional Indonesian food, sate stands, fresh seafood, there are just too many good things to choose from at the busy night market on Gili T. Starting after sunset and perfectly lively until late at night, get your fix of local food here. Pizza is surprisingly popular on the Gili Islands and who is not up for some great wood-fired pizza at some point on their holiday, no matter where in the world you are holidaying? 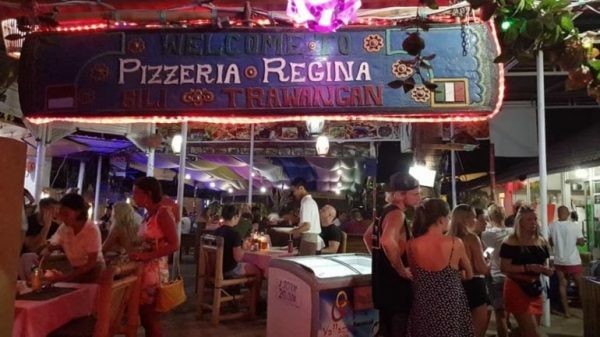 Regina is the best pizza to be found on Gili Trawangan, tucked away in a quiet back street. The chef is Italian and so you can be sure your pizza is authentic and mouthwateringly good. The size is big and the price is affordable. Check this one out! Prices start at US$210 (low season) and US$300 (peak season). A true tropical home is what Villa Sahara Sands is. Traditional alang- alang thatched rooftops, an airy and sunlight-soaked open-plan living space and a breezy porch with a comfy white-painted bamboo daybed. The perfect spot to curl up with something to read, I would say. Inside, there is a well-appointed kitchen with a bar that functions as a dining table and there is a seating area to sit together with drinks at any time of the day. 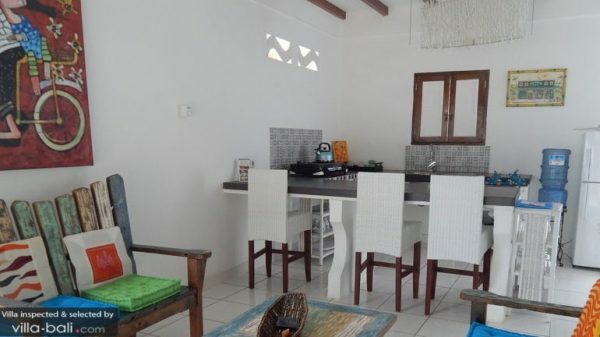 The 3 bedrooms are more like tropical huts fitted with modern comforts such as air-conditioning and hot water. This beach house will charm you away instantly and it is perfectly affordable, too. Walking out of your private garden puts you straight on the sandy beach of Gili Trawangan where you can go swimming and snorkelling in the azure blue sea. The harbour of Gili T is just a 15-minute stroll away. 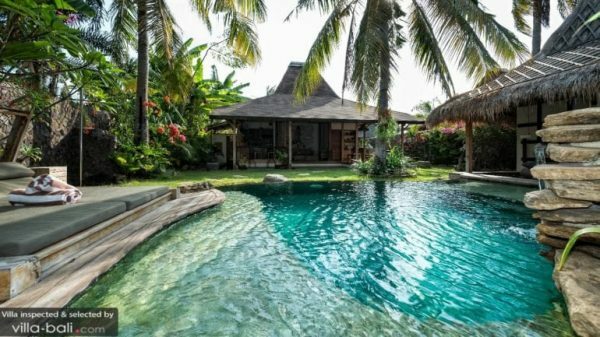 This gorgeous luxury retreat, located by the beach on Gili Trawangan, features traditional Javanese Joglo houses and a huge lush green garden with a private lagoon-like swimming pool. So much space and just 1 bedroom suite, Villa Bhuvana is perfect for honeymooners seeking a luxury getaway on a tiny tropical island. An amazing setting, a superb location and 5-star services that includes a private master chef, your stay at this villa will be utmost blissful and romantic. 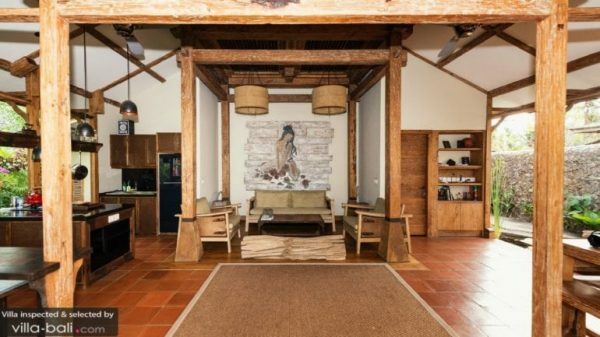 The villa has a real rustic feel to it, built with reclaimed teak wood of a 150 years old. 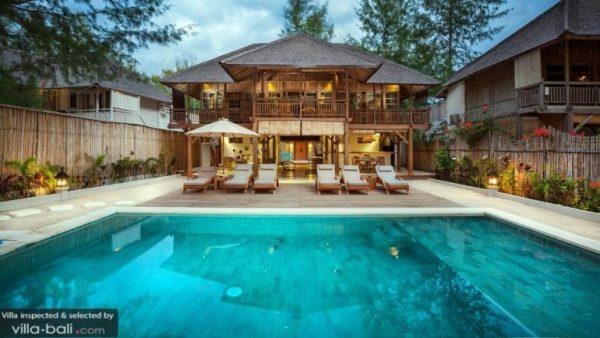 Villa Bhuvana is located on the quiet north side of the island right by the turquoise sea. A quick bicycle ride will get you to busy part of town in no time where you can shop, have coffee and dine by the seaside. The party strip is located on the other side of the island, also easy to reach with a bicycle or horse cart. Prices start at US$250 (low season) and US$350 (peak season). 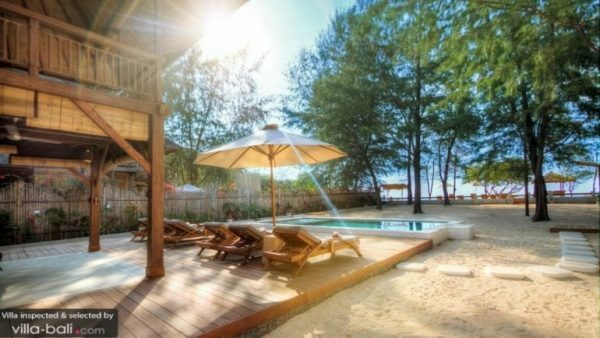 A huge, sandy beachfront garden with a private glistening swimming pool and a gorgeous teak wooden pavilion with two levels, Gili Beach Villa 2 makes an amazing holiday home on the Gili’s. 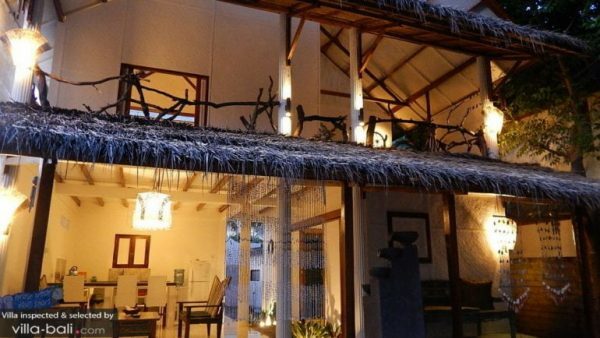 Housing 4 bedrooms, this villa is ideal for one big family or two smaller families who like to spend their holidays together this year in Indonesia. Bicycles and snorkelling sets are available free of charge, the beach lies right in front of the villa and the pool has a shallow end for the kids. Who could think of a better family vacation home than this? 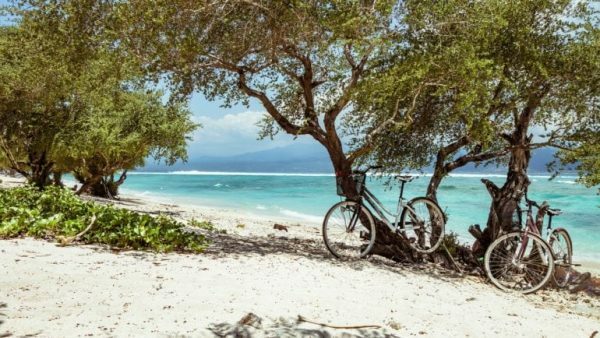 Perched on the northern side of the island, the location of Gili Beach Villa 2 is perfectly peaceful while the busy area with restaurants, bars and nightlife is just minutes away on your bicycle. The beach in the front is perfect for snorkelling right from shore. Prices start at US$495 (low season), US$595 (high season) and US$695 (peak season). From Bali, there are 3 ways to get to Gili Trawangan. 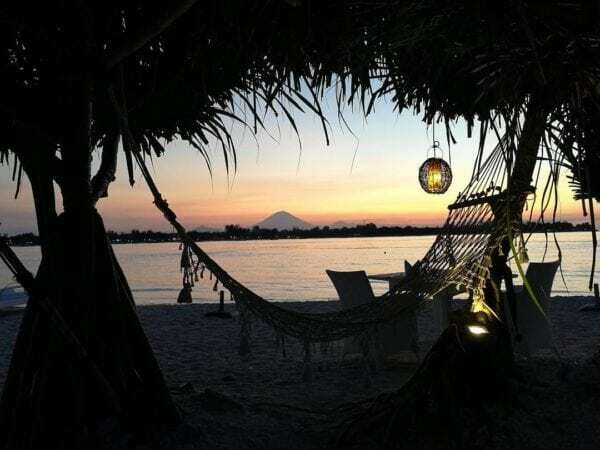 No matter where in Bali you are staying, you can book your ticket to Gili Trawangan through a street vendor and it also includes a pick-up from your private villa. You can also ask the staff of your villa to help you get tickets, surely they’ll be happy to help. Boats leave from Padangbai in the east of Bali and from Amed, even further east. You can also choose to fly to Lombok and take the boat from there. Padangbai is the main gateway to get to the Gili Islands for most travellers. Speedboats leave every day, shipping island visitors over all day long. The boat ride from Padangbai takes approximately 3 hours. If you are prone to seasickness, take some motion sickness pills in case the sea is rough. 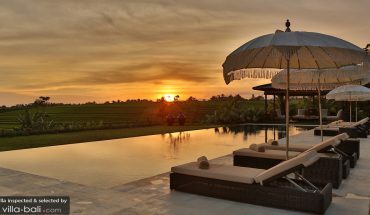 The price of the ticket depends on where you are staying on Bali Island. From Kuta/Seminyak area, prices start from Rp. 450,000 for a return but you might need to bargain to get this price. The public ferry is an alternative for travellers on a tight budget and lots of time, taking 5 hours and costing only Rp. 40,000 one way. Not everyone knows about this, but from Amed, you can also get to the Gili’s and it’s a much shorter boat ride. The crossing takes approximately 45 minutes and the price is Rp.250,000 for a one-way trip. The Pacha Express leaves twice a day, one at 9 am and one at 4 pm. 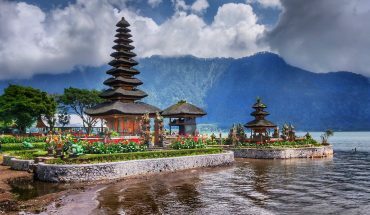 There are flights daily from Bali’s international airport to Lombok. The flight takes just 45 minutes and you can book a return for less than Rp. 500,000. 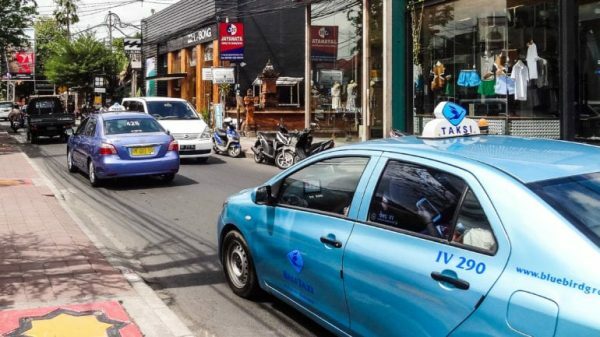 From the airport, you can get to the harbour of Bangsal in around 2 hours costing Rp.250,000 by metered taxi. From the harbour, the slow boat to Gili T costs Rp. 15,000 and the fast boat Rp. 80,000 taking 40 minutes or a speedy 10 minutes or less.